With over 9 million copies sold, the Adventure Bible brand is beloved by Christian schools, churches, and families alike. Now, the #1 Bible for kids, including all of the trusted essentials loved by parents, is available in an exciting polar exploration theme! Ready for a frosty Adventure? Embark on a fun, exciting trek through God’s Word with the NIV Adventure Bible, now in an all-new polar exploration theme! While on this arctic adventure, readers meet all types of people, see all sorts of places, and learn all kinds of facts about the Bible. And most importantly you’ll grow closer in your relationship with God. • Twenty polar-themed pages focus on topics such as how to know you are a Christian, famous people of the Bible, highlights of the life of Jesus, and how to pray. You can purchase the Adventure Bible here. I am really loving the new features of this Adventure Bible and cannot wait to give it to our 11 year old to use. As one of my readers, you have a chance to win a copy of the Adventure Bible Polar Exploration Edition! We just spent a lovely weekend in Monterey Bay, enjoying much needed family time, celebrating my Dad’s 86th Birthday, and escaping the smokey air that has enveloped Northern California this past week. Our thoughts and prayers continue to be with those affected by recent wildfires in our home state. Hillsong believes that teaching children to love God and others takes place in both the home and in the church. For this reason they seek to partner with parents (the greatest teachers of all!) and with church pastors and leaders, equipping them with great resources. Through fun experiences, meaningful music and ministry that encourages kids to participate, Hillsong Kids presents Jesus Christ and His Church in a relevant way, creating moments which children will never forget. “Can You Believe It!? – Songs of Truth” is both a question and a challenge… a statement of gratitude to a loving God and an invitation to explore the very foundations of faith. Classic songs like “My Best Friend”, “Oceans (Where Feet May Fail)” and “What A Beautiful Name” join brand new declarations of faith such as “As The World Shakes” & “Heaven Is Our Home”. We pray that this collection of fun and vibrant songs, help children around the world to declare biblical truths about God’s love and grace for them. 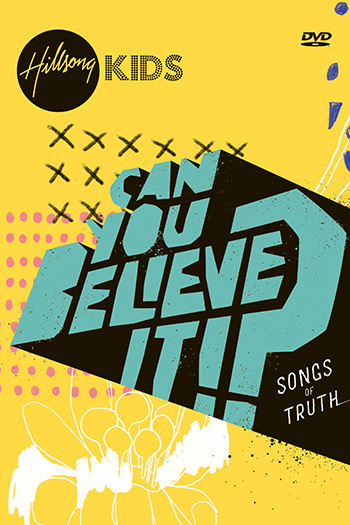 Thanks toPropeller/FlyBy Promotions, I am giving away a copy of the dvd “Can You Believe It?” to one of my readers. This is a short giveaway so be sure to enter by Thursday! You can also purchase the dvd here. The giveaway is closed. The winner is Andy! It’s been awhile, but I’m happy to be back and am so excited to share with you about Chris Tomlin’s new album, HOLY ROAR! Chris Tomlin is one of the most heralded singer-songwriters in the world who has amassed an impressive body of work. He has sold more than 8 million albums, 11.3 million digital tracks with 16 #1 singles. Chris is one of only four artists ever to receive the Sound Exchange Digital Radio Award for over 1 Billion digital radio streams, others include Justin Timberlake, Pitbull and Garth Brooks. The Grammy® winner’s list of music awards include an American Music Award, 3 Billboard Music Awards, 21 Dove Awards, a BMI Songwriter of the Year Award and more. Chris’ concert tours have sold-out venues in major cities including New York City’s Madison Square Garden, The Forum in Los Angeles, Nashville’s Bridgestone Arena and Red Rocks in Denver, among others. This spring, Chris marked another career milestone by launching his own imprint record label, Bowyer & Bow, in partnership with Capitol Christian Music Group. About HOLY ROAR: the freedom, the experience, the wonder of worship. It is seeing the church come together, hands lifted to God, pouring out our praise with an eternal song in our hearts. It’s every voice together, changing the way we worship. Thanks to FlyBy Promotions, I have an opportunity for you to win the audio cd of Holy Roar. I am really loving this album and I know you will enjoy it too. Giveaway Closed! Our winner is Tania! “Passion is more than music. WHOLE HEART was captured live at the Passion Conference 2018 in Atlanta, GA.
Tis the Season! and the kids have been busy coming up with their wish lists for Christmas. On their lists are the typical “wants” like a Nintendo Switch and L.O.L Surprise Dolls, “needs” like clothes and good books, and things like “something for my brother” or “something for my sister,” that warms our hearts & puts a smile on our faces. As our family prepares for the Christmas Season, we have decided to come up with a new tradition…A Kindness List, with the purpose of teaching the kids to focus not only on themselves but on other people as well. To help inspire us along the way, we will be using The Kindness Elves! The Kindness Elves was started in 2013 by Mom Anna of The Imagination Tree. The elves encourage kids to carry out acts of kindness to friends, family, neighbors…just about anyone! Earlier this year, I bought the Kindness Elves Set and Storybook (because story time is a favorite around here). I still can’t get over how cute the little elves are and with many options to choose from, you can be sure to find the right ones. Isn’t their elf house adorable? It has a working mail box for sending and receiving Elf Mail. Just recently, we received the Kindness Elves Accessories Pack, that includes 50 wonderful Acts of Kindness cards, a Little Book of Big Kindnesses memory book, postcards, stickers and a bottle of magic sprinkles. This is such a fun tool to have and I cannot wait to get started with these. You can also find a Family Bundle Pack and a Classroom Bundle Pack on the Kindness Elves website. Who would like a Kindness Elves set of their own? We have just the opportunity for you! GIVEAWAY TIME!!! – I’m teaming up with Anna at The Imagination Tree to give one lucky reader a Kindness Elves set. To enter, leave a comment telling me what your favorite Christmas tradition is, what tradition you hope to start or ideas you would write on a Kindness List. For extra entries, tweet about this giveaway or share about it on Facebook, and let me know in the comments section. Giveaway ends on Sunday, December 3rd, 2017 at 11pm PST. The giveaway is now closed and the winner is…. Start your own Holiday Traditions with the Kindness Elves this year! God’s Big Plans for Me Storybook Bible illustrates the 40 foundational principles written in the #1 New York Times bestseller The Purpose Driven Life by Pastor Rick Warren. With child-friendly language, engaging illustrations, and a chronological approach, Pastor Warren introduces each Bible story with a theme that aligns with one of his foundational principles. He wraps up the stories with a closing thought targeted to early readers. The colorful illustrations and narrative tone bring these beloved Bible stories to life for readers young and old. God’s Big Plans for Me Storybook Bible has foil decoration on the cover. You can also download free bible memory verses used in this storybook bible. They can be found here. This is a good storybook bible for older preschool and elementary aged kids. The illustrations are vibrant and the stories are just long enough to keep their attention. I appreciate that the three closing thoughts & question at the end of each chapter provide the opportunity to have reflective conversations with my children. The Giveaway is now closed. The winner is Tiffany! “Disclosure (in accordance with the FTC’s 16 CFR, Part 255: “Guides Concerning the Use of Endorsements and Testimonials in Advertising”): Many thanks to Propeller Consulting, LLC for providing this prize for the giveaway. Choice of winners and opinions are 100% my own and NOT influenced by monetary compensation. I did receive a sample of the product in exchange for this review and post. Only one entrant per mailing address, per giveaway. If you have won a prize from our sponsor Propeller /FlyBy Promotions in the last 30 days on the same blog, you are not eligible to win. Or if you have won the same prize on another blog, you are not eligible to win it again. Winner is subject to eligibility verification. I’ve been listening to Amy Grant since the 1980s, being introduced to her songs like El Shaddai and Thy Word, by my church youth leaders. I shall be forever grateful to them for exposing me to great, uplifting, inspiring and encouraging Christian artists. In high school, our church youth choir also performed Amy Grant’s Emmanuel/Little Town/Christmas Hymn. It’s still one of my favorite pieces to listen to and I have fond memories of practicing and performing those songs. I’ll be hosting a few more giveaways this month, thanks to FlyBy Promotions. Subscribe to my blog or come back often to see what new things we have for you. Giveaway now closed. The winner is Robin! Congratulations! Only one entrant per mailing address, per giveaway. If you have won a prize from our sponsor Propeller /FlyBy Promotions in the last 30 days, you are not eligible to win. Or if you have won the same prize on another blog, you are not eligible to win it again. Winner is subject to eligibility verification.